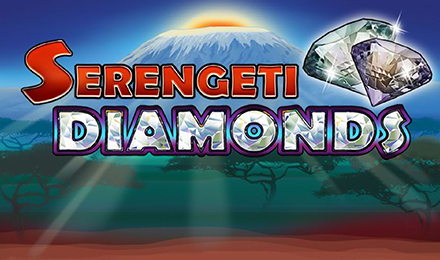 Serengeti Diamonds slots | Vegas Spins | Play now! Get our your tools and get ready to uncover the brightest diamonds in the rough when you play with Serengeti Diamonds slots! Line up the jewels and start winning now! Get wild in the exotic Serengeti when you play this exciting slots game. Serengeti Diamonds will have you digging for glistening treasure whilst you spin to win in this colourful 25 line slot game! Uncover the precious jewels of Africa and trigger the Scatter bonus. Line up your winning jeweles amongst the mighty lion, elephant, and trible symbols to win free spins and bonus rounds! Use the Autoplay feature for more ease and set the game to repeat bets as you please. Get busy spinning now and claim your throne as king of the Serengeti!